My plant babies are nothing if not well-accessorized. 1. A four-piece garden tool set with comfortable handles so you always have *just* what you need to get any landscaping job done. 2. A foldaway kneeler to protect your precious knees from twigs, stones, and dirt as you tend to your plant babies. 3. A easy-pour watering can with an adjustable head so you can water plants without straining your wrist and choose from two different ~pour styles~. Yeah. You have different pour styles. You're that much of a garden professional. 4. A set of basic gardening gloves with a nitrile coating to keep your hands clean and safe while doing any gardening in dry or wet soil. 5. A vertical garden grid so your plants can finally hang on the wall like the works of art they are. 6. A raised garden bed that will take your backyard flower game to new ~heights~. The bed is made of metal (no rotting!) and holds 11 cubic feet of soil. 7. An outdoor workbench so you can have a dedicated space for doing the work you love most. Every day you spend at this desk will be GREAT time spent at the "office." The bench has a large drawer, a sink, hooks for tools, open shelves, and a large workspace. 8. A decorative garden wagon to show off your most beloved plants in style (and maybe take them for a joyride every now and again). 9. A Scotts Turf Builder for spreading anything from grass seed to fertilizer as quickly as possible. Now you might actually have some time to enjoy your lawn instead of just tending to it. 10. A lovely bronze tiered plant stand that's a true ~step up~ from traditional planters. 11. A pair of Fiskars pruners so you can give all of your smaller plants a haircut whenever it's needed this season. 12. And a pair of Fiskars hedge sheers so you can give all of your bigger plants a haircut as soon as they get unruly. 13. A large planter that's like the one bedroom apartment of planters — the pad your beloved trees certainly deserve. The planter is 16" x 16" x 16", plenty big for your more ~mature~ plants. 14. A rolling work scooter so you can stay comfortable as you toil away in the garden. If you find that your knees and back really ache after a day of weeding, this is for you! 15. A set of four hanging planters with coconut lining to cheer up your porch with some plants or floral displays. 16. 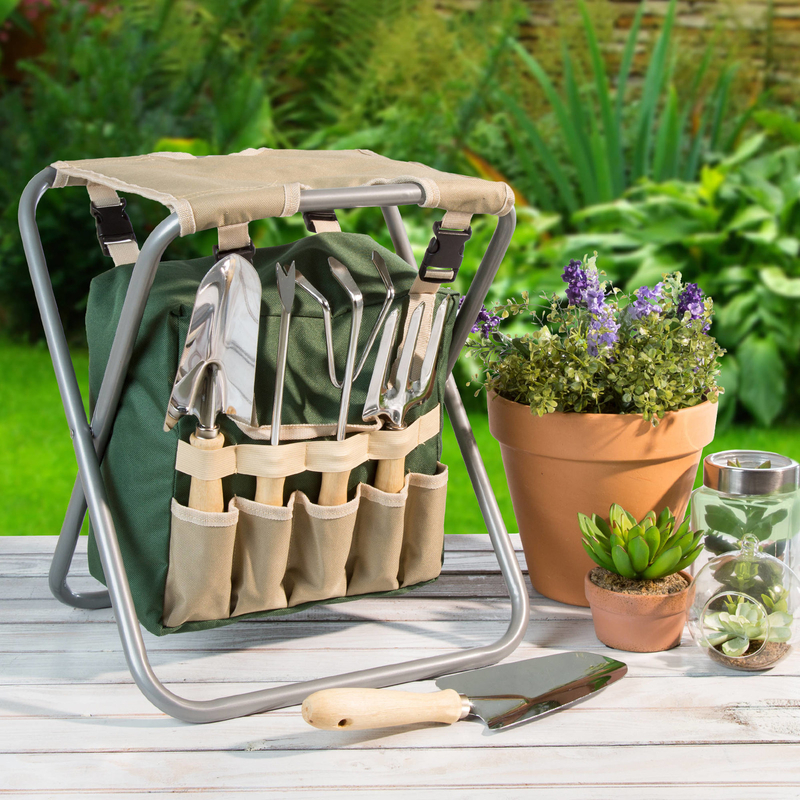 A folding garden stool and tool set so you can take a little rest and admire all of your hard work as you're planting (and save your booty from dreaded mud stains). 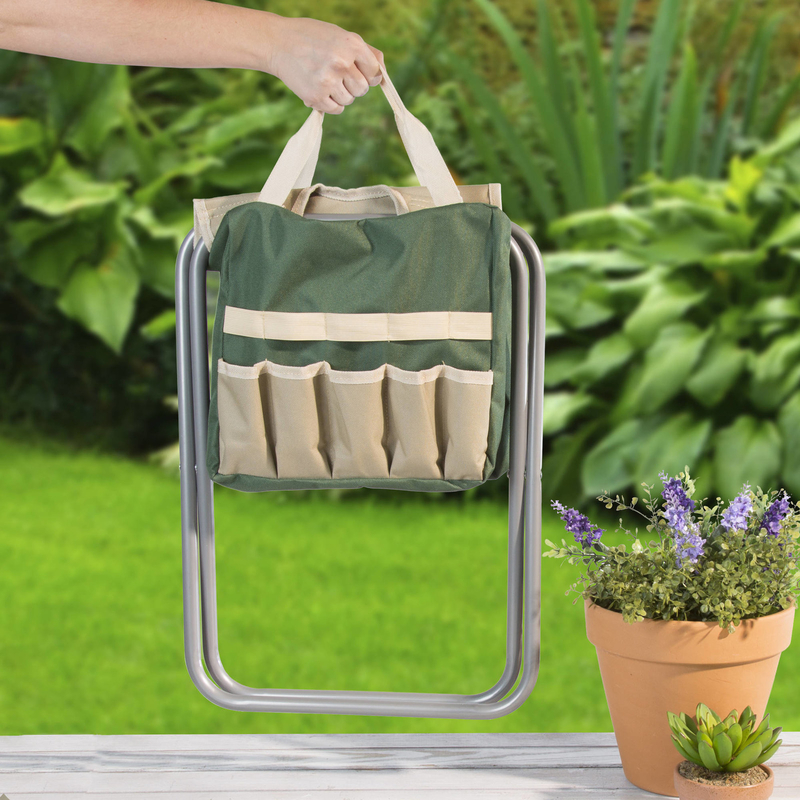 The stool/bag has seven pockets, a zipper pocket, and comes with a weeder, fork, trowel, cultivator, and transplanter. 17. A rolling lawn aerator to help your lawn get a breath of fresh air. Aerating grass helps water and nutrients reach the roots more easily, resulting in a lush, happy yard. 18. A set of six strawberry supports that will raise your precious home-grown fruit off the ground and minimize the risk of rot or mold. 19. A nice, long garden hose so your *entire* garden can get some love, not just the small radius close to where your hose lives. 20. A wall mounted garden hose storage caddy with an interior storage space to keep your hose nice and organized and any small hose ~accessories~ tucked away. Heads up that screws are not included! 21. A bag of organic lawn food that will nourish your lawn without the use of harsh chemicals. It's also not manure-based, so both your lawn *and* your nose will be happy. 22. 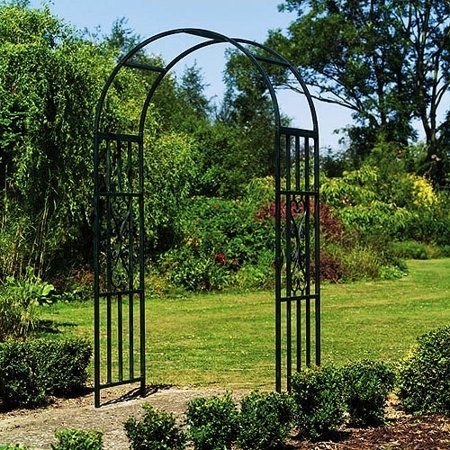 A beautiful arched trellis that will make your home look like something out of a fairytale when it's covered in vines. The vinyl trellis is UV-treated, so it won't yellow over time. 23. A set of gardening gloves with claws for forgoing the trowel and digging all of your small holes for planting with your own two hands. 24. An elevated planter so you can have a nice view of even your littlest plants *and* add to the chic, rustic look you've been going for with your outdoor space. 25. A Martha Stewart wand hose attachment whose adjustable flow rate allows you to water plants gently without eroding any soil. The wand's padded grip and long length will make watering much more comfortable! 26. 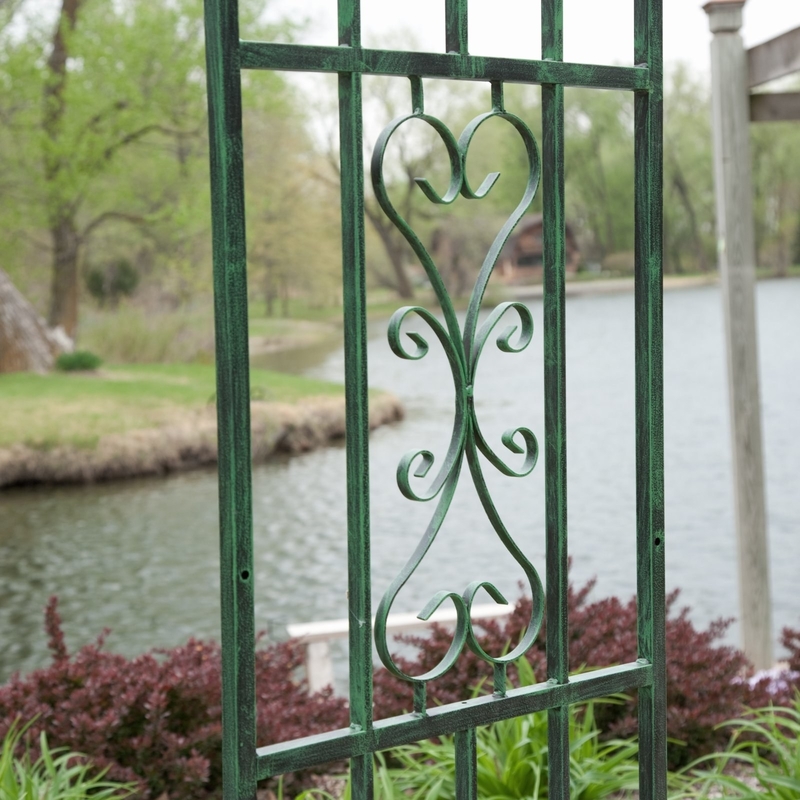 A metal arbor because with a little assistance, your climbing plants can reaaaach up and thrive. 27. A garden tool hanger to keep all of your rakes, shovels, and long-handled gear in line. 28. A mini oscillating sprinkler with adjustable range and flow control so you can water your entire lawn and garden hands-free. Just make sure to adjust that range so you don't waste water on your driveway or fence. 29. A wheelbarrow that will allow you to transport heavy soil and gardening materials with ease. Enjoy watching all of your plant babies grow this season, folks! *Wipes away a single tear* They grow up so fast.